A brief teaser for X-Men: Days of Future Past has provided glimpses into the film's take on Wolverine, Professor X, Storm and Magneto. If you haven't seen it, X-Men: First Class was arguably one of the best superhero movies to come out in recent years, combining the bombast of comic books and the dynamic of a period piece to create an experience that was both fun and, at times, poignant. In turn, its sequel X-Men: Days of Future Past looks to be upping its ambition to a scale beyond what past X-Men films have ever approached, meshing the casts of multiple films together in an adaptation of one of the comic series' most famous and beloved story lines. Also, it will have Sentinels. A feature length trailer for the movie is set to come out next week. That said, the filmmakers, apparently unable to wait that long, have released a six second teaser that, on its own, should be more than enough to leave eager fans even more excited for the film. The teaser in question is pretty much just a series of incredibly brief clips from the movie strung together. 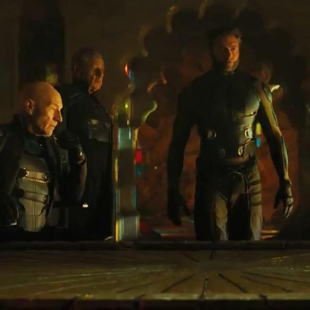 That said, it manages to show off a whole smorgasbord of X-goodies including Hugh Jackman's Wolverine, Patrick Stewart and Ian MckKellan as Professor X and Magneto, Halle Berry's Storm, a roaring Beast, and a younger Magneto behaving none-too-friendly toward Jennifer Lawrence's Mystique. Just personally, as someone who loved First Class and the X-Men in general, this teaser, teeny as it is, has me pretty hyped to see next week's trailer and, of course, the movie when it finally comes out. What do you think? Is this brief video enough to win you over, or are you still waiting to be sold on Days of Future Past?